Tonight’s post is inspired by my friend Kathy Drake. Kathy and I grew up together and originally bonded over the fact that we both wore the same lavender jacket to our kindergarten class. When we were in high school we also worked together at Dunkin Donuts and slung bagels and coffee like pros. Anyway, tonight she posted a picture of a Leg Lamp cookie cutter she received as a gift and I instantly wanted one. 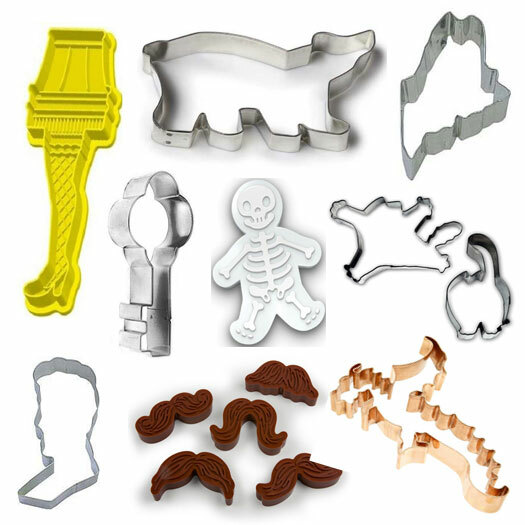 Then I started wondering what other wacky cookie cutters might be currently kicking around on the web. In a few weeks we’ll all be thoroughly sick of stars, snowmen, and Christmas trees and hopefully you’ll remember this post and get inspired all over again. The Leg Lamp from A Christmas Story – you won’t shoot your eye out with this, kid but you could make some seriously nostalgic baked goods. How cute is that polar bear?! A little basic white icing, maybe some coconut and you’ve got a great excuse to eat your way through the next snow day. Sorry, had to give a shootout to my home state. Depending on the season that cookie could be spread with white, black, green, or even brown icing. I suppose only people from Maine will probably understand that I’m referencing “mud season” and “black fly” season via the colors brown and black. That key is just cool. I’d make them pink. Naturally. Skeleton Gingerbread Man will put a smile on all your hipster friends overly bearded faces. Simon the Cat is just fantastic. He reminds me of Dexter. Here’s a link to my favorite Simon episode. President Lincoln! Or edible Daniel Day-Lewis — whatever you prefer. Everyone is obsessed with mustaches. I really don’t get the appeal but I’m sharing these with you anyway. Here be dragons! How amazing is this cutter? Bake a batch of these and sneak some Smaug cookies into a late night showing of The Hobbit next month. You’re welcome! Edible Daniel Day-Lewis. Yes, please. never heard of Simon’s Cat before. Must watch all now!